Dan Gasby and B. Smith attend BET Honors 2013: Debra Lee Pre-Dinner at The Library of Congress on January 11, 2013 in Washington, DC. 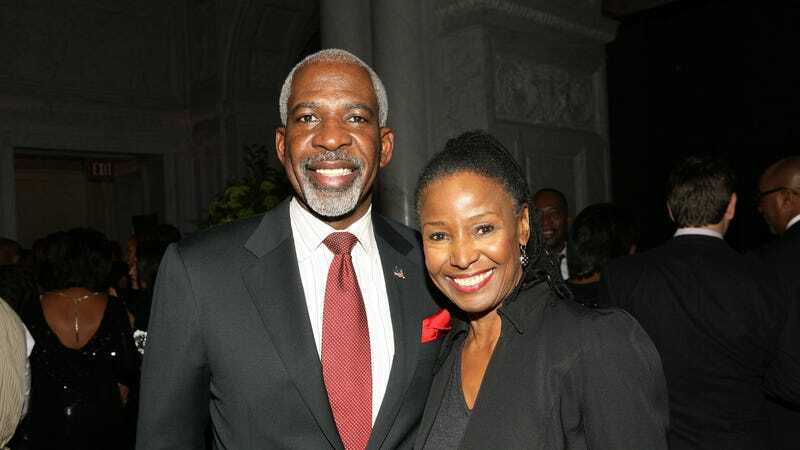 Dan Gasby—the husband of style and fashion guru, restaurateur, and Alzheimer’s patient B. Smith—recently made a very public announcement: While he remains devoted to his wife, he is also in a deeply committed relationship with another woman, who happens to be white. Gasby’s admission ignited a virulent, often nasty, and I feel unreasoning backlash within the black community. A video of Gasby, his daughter Dana, B., and Alex Lerner, the new, sometimes live-in partner who helps Dan and Dana care for B., was released as part of a Washington Post profile. For many people, watching them spending time together was both offensive and an affront. When they saw that video, they saw a travesty. When I saw the video, I saw a happy ending. I saw a 21st century extended family responding to one of the cruelest diseases of our time. I spent four years imaging, researching, and writing a novel about an African American family impacted by Alzheimer’s disease, The Wide Circumference of Love. I subsequently wrote a major magazine article about the devastating and disproportionate impact of Alzheimer’s on African Americans, as well as editing an anthology of fiction and nonfiction by writers affected by the disease as caregivers, family members and friends. I have no personal connection to Alzheimer’s, but through the scores of interviews I conducted with those with the disease and those caring for them, I have learned Alzheimer’s is a disease that kills those with it twice: once as they become unmoored from memory, family and the lives they have lived, and again when they die from this fatal, irreversible disease. In a sense, caregivers are in a constant state of grief, for what they live through day to day and the inevitable outcome they can only forestall but not change. Alzheimer’s is an irreversible, progressive brain disorder that slowly destroys memory and thinking skills, and eventually, the ability to carry out simple tasks. Five-and-a-half million Americans have Alzheimer’s disease. There is no cure. Alzheimer’s is the most common form of dementia, of which there are numerous types—vascular, Lewy bodies, etc.—that affect mental cognition. Studies by the American Alzheimer’s Association and NIH have revealed the frightening impact of this disease on black Americans. African Americans are twice as likely to develop Alzheimer’s as whites, represent only 3-to-5% of those enrolled in clinical trials to find a cure, and women—especially African American women—are the fastest growing group developing the disease. Seventy percent of those caring for someone with Alzheimer’s disease die before the person they are caring for—70 percent. Dan Gasby wisely decided he did not want to be one of those represented by that statistic. The toxic response to his decision is, I feel, a mixture of black racial animus (Alex Lerner has been called a whore in some online posts, and has been accused of stealing B. Smith’s money) and deep discomfort, as this relationship challenges many people’s ethical and religious views about marriage, loyalty, and love. But Alzheimer’s is already a disease that changes everything. The economic burden of caring for those with Alzheimer’s disease in the black community alone is estimated to be $21 billion dollars. Black women are disproportionately impacted—both as caregivers and as those with Alzheimer’s. Young and middle-aged children all over the country are leaving the workforce early to care for parents with dementia. Relationships between grandchildren and grandparents have been dramatically altered as so many grandchildren only know their grandparents as people with the disease. Marriage, too, inevitably has been impacted, as more and more caregivers decide they have a right to emotional wellbeing, health, new relationships, and love. B. Smith is no longer the wife of Dan Gasby, not in any way that we define a wife as an emotional partner who is cognizant of her partner’s needs, desires, and can co-create a relationship. In my research, I spoke with many researchers and experts who had studied the impact of Alzheimer’s on African Americans. Again and again, the inability of African American caregivers to engage in self-care was cited as a danger both to the person being cared for and the caregiver. In our community, the long, ugly history of mistreatment, exploitation and racism that we have experienced at the hands of the health and medical industries has bred distrust. As a result, we often feel that our sick loved ones can only be cared for with compassion by our families. And our families are too often expected to sacrifice nearly everything to ensure that Mom and Pop are OK. And “everything” includes our well-being. High blood pressure, diabetes and obesity are already rampant in our community. Those overwhelmed by caregiving often neglect their health physically and emotionally, which results in premature death as they ignore their own issues with these preexisting conditions. Dan Gasby is providing an alternative model; and he is willing to be the point person for a long overdue conversation about the lives and needs of America’s caregivers, who comprise an unpaid, silent, unrecognized army keeping families together and ensuring that those with Alzheimer’s live to see another day. When she received the diagnosis of Alzheimer’s, B. Smith told her husband they should write a book. Dan is a talented, creative media producer who helped mastermind his wife’s success. They both knew that they were symbols and felt they had a responsibility to go public in order to remove the shame and stigma around the disease. Their book, Before I Forget Love: Hope, Help, and Acceptance in Our Fight Against Alzheimer’s, became a national bestseller, and their media appearances had a powerful impact on awareness of the disease among African Americans. I can only guess, but I assume Dan’s regular Facebook posts about the progress of the disease and its impact on their lives are for him an extension of activism. And that activism includes acknowledging the pain, but also the feelings of relief and contentment he feels as he shapes a new life… with a new woman. A life that still includes his beloved B. Love in the age of Alzheimer’s will challenge and change us. Let’s just keep our hearts open. And let’s try to imagine, for a minute, walking in someone else’s shoes. Marita Golden is the award-winning author of 17 works of fiction and nonfiction, most recently, The Wide Circumference of Love. Who’s the Keeper of Your Mother’s Memories When She Can’t Remember Them?